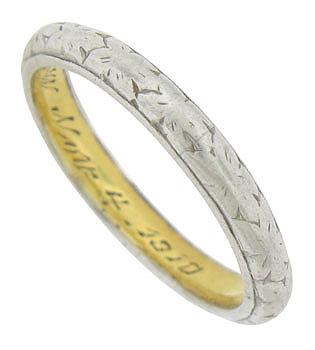 This elegant antique wedding band is crafted of platinum and 18K yellow gold. 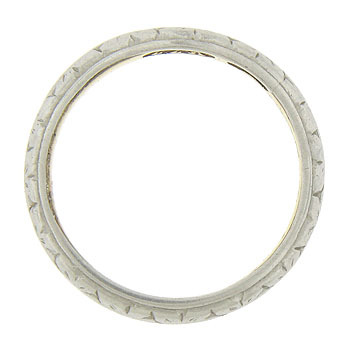 The outer band is a floral engraved platinum metal, while the inside of the ring is finished in yellow gold. 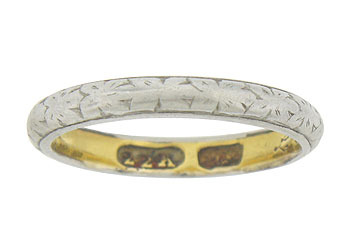 The Edwardian ring measures 2.70 mm in width. Inscribed "L.C to R.W. Nov. 4 - 1910". Circa: 1910. Size 5. We cannot re-size.